What’s the hype with protein? What is it with protein? You hear about it all the time. So what’s the hype? Does protein control blood sugar levels? It has a definite effect on diabetes and your blood sugar but also has many benefits. If you want to keep your cells healthy, grow and develop optimally, and build lean muscle to blast pesky fat, you have to eat protein, according to nutrition experts at Medline Plus! I’d like to give you all the basic information you need to know about protein, in order to build your healthy eating plan for life. The focus is to understand how important protein is in your overall health and wellness. Try and think of this article as a journal of information. It can be something you can use as a reference tool to strengthen your overall health and wellness knowledge about protein. Without protein on a regular basis, you wouldn’t survive very long at all. Protein is one of three macronutrients your body requires to function. A macronutrient means you need this nutrient in large amounts. Protein isn’t something your body manufactures internally, which means you have to get it from a food source daily. I’ll get into food sources in a bit. You can’t store protein for long periods of time, so eating it regularly is important. This essential nutrient comes in different types; complete and incomplete. 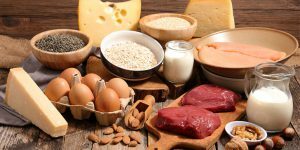 In this article I hope to show you the difference, and help you to gather the knowledge required to ensure you’re getting the best protein for you, keeping in mind your preferences and tolerances. Protein is a food factor that can help you lose weight and keep it off. I’m all for weight loss! I just want to get technical here for a minute. Proteins are large molecules that have specific amino acids which your body and the cells in your body requires to function optimally. Your body cells, structure, cell regulation, function, tissues and organs, can’t survive without protein. Protein is also responsible for transporting oxygen to your internal systems through your blood, acting as a neurotransmitter. Therefore, every cell in your body has protein. That’s important to know. All of your body tissues including your skin, organs, muscles and bones contain protein. Were you aware that antibodies, hormones and enzymes are proteins? According to Iowa State University Nutrition Department, there’s over 10,000 different proteins that are required to maintain your good health. Protein is so important for your health. It is made of amino acids, which are the building blocks of your life. They are clustered together in various patterns to create specific proteins, each for a slightly different function. There are 20 amino acids in total. Eight of these are essential, which means your body can’t make them, so you have to get them by eating food. But which ones? COMPLETE PROTEIN – These are proteins that must have all 20 amino acids present in the food. Animal and fish foods are your best option to get complete protein. Beef, chicken, milk, and yogurt, are examples of complete protein sources as well. INCOMPLETE PROTEIN- These are protein sources that lack one or more of the 20 essential amino acids. Many people call these partial proteins. This is similar to putting a puzzle together. In order to form a complete protein you’re going to need the right combination of partial proteins, in the right amounts. That’s where it gets a bit tricky. Most plant source proteins are incomplete. The exception is quinoa, which is a grain complete protein source. Vegetarians often have a protein deficiency, simply because they may be eating protein-rich plant sources, but if they are missing any one of the essential amino acids, their body doesn’t have the recipe to create protein for use. Whole grain, beans, peas and seeds, are typical incomplete protein sources. As with everything in life, finding the right balance is the priority. You need protein to be healthy, and too little or too much creates a negative. Here are the benefits of getting just the right amount of protein in your daily diet! *MORE MUSCLE – LEANER BODY- Protein stimulates protein synthesis and helps deter immediate protein breakdown, which helps sustain and build lean protein muscle mass. Eating protein helps ensure your body doesn’t lose or start breaking down protein for energy, and promotes muscle strength and development. You want more muscle and less fat. *INCREASED METABOLISM- Muscle burns more calories than fat. And when you’re getting an adequate amount of protein and building lean muscle, your body is naturally going to work harder for you. The result is using more energy to blast fat and get you thinner and stronger. *EAT LESS- Health experts report, eating less triggers your thermic effect. This is where the food and protein require almost twice the amount of calories to breakdown carbohydrates. So then protein fills you up with energy that lasts longer, and it works harder for you to burn off more energy. Doesn’t that make total sense to you? *FASTER MUSCLE BUILDING- Research studies show that feeding your body with adequate amounts of complete protein helps in faster muscle building. Fueling your body with protein before and immediately after a workout is essential in preventing the breakdown of muscles to be used for energy. Let’s get those muscles built up! If you don’t get enough protein in your diet, your body will naturally start breaking down from the inside out. Your muscles will be taken apart, and this protein will be used to give your body energy. You can start building your muscles with some light weight training and build yourself up from there. *LESS TUMMY FAT- Experts from Nutrition Daily state that quality complete protein at every meal encourages belly fat shrinkage. Scientists also believe about 10 grams per meal is the minimum protein required to trigger protein synthesis and fat burn. If you can start losing belly fat just by having 10 grams of protein at a meal, why wouldn’t you do it? Of course you would! 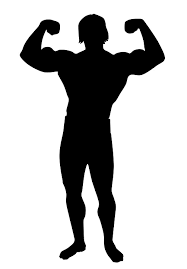 *IMPROVED STRENGTH- Lots of studies show that a diet with a good amount of protein encourages a stronger body. It absolutely makes sense because muscle strength is a factor in overall body strength. You should be eating your protein to build your muscles bigger and stronger, and you’re going to continue to build your overall body strength. That sounds like a great plan to me! *LESS INJURY AND FASTER RECOVERY- A lean muscular body lessens your risk of injury and reduces recovery time when an injury occurs. Eating protein immediately after an intense training session can help you to recover faster. Try not to get injured in the first place. Use caution because it’s easier to prevent than to deal with an injury. If you want to improve your strength, endurance, and speed, you would have to exercise hard enough to injure your muscles. So when you’re muscles heal, they’re stronger. That’s how you build muscle. You work hard and damage it, eat your protein and build it stronger. May not sound like fun, but that’s the way it works. *IMPROVED THINKING- Protein is responsible for energy production, hunger, motivation, thinking, and wakefulness. Scientific research shows that various brain disorders like ADHD and schizophrenia, are associated with inadequate absorption of protein. Protein is a brain food, so make sure you eat a diverse range of protein daily if you want to think clearly and be more attentive throughout the day. *BETTER QUALITY SLEEP- Research shows that protein is somehow connected with your internal sleep to wake cycle. Protein may optimize chemical transmitter balance, helping you to settle down to sleep at night, and trigger you to be energized to face the next day. It’s also important to note that complex healthy carbs just before bed may actually help you get to sleep, because they trigger the release or serotonin, your sleep drug. However, it’s the protein that’s going to help you stay asleep. So it’s important for you to find your healthy balance. You don’t want insomnia or having any sleep issues because I’m sure you’re aware of just how important a good night’s sleep is. *LOWER BLOOD PRESSURE- Health experts report, studies show lower blood pressure in individuals suffering from hypertension, when protein intake is increased. This could be from the natural increase in calorie burn associated with eating healthy protein in the right amounts. *LONGER LIFE- Having a healthy strong mind and body is associated with living longer. By focusing on quality protein and removing simple carbs from your diet, you’ll help to control your blood sugars, reduce your risk of diabetes and cancers, and ward off cardiovascular disease. In particular, a diet high in whey protein is proven to increase longevity by elevating the most powerful antioxidant we have, which is glutathione. Individuals with higher levels of this antioxidant lower their risk of disease and dying. Let’s all do whatever it takes to live a longer healthier life. Inadequate amounts of protein can result in serious illness and disease. You need protein in order to provide your body with optimal energy to function properly, this in addition to building and maintaining lean muscle strength, and keeping your hair, nails, and skin healthy. You don’t want to be protein deficient. NOTE – If you are experiencing the above symptoms it’s important to seek immediate medical attention. It’s better to be safe than sorry! Infants and young children in particular are vulnerable to serious growth issues with protein deficiency. Many children in third world countries die from diseases causes by inadequate protein. It’s a sad fact to think about and a tragic reality for many. This disease can be prevented with adequate protein intake. However many of the effects are not reversible, as much of this occurs during the development and growth process. Marasmus is another form of severe malnutrition where muscle, tissue, and fat chronically waste away. The result of lack of protein and calories. Marasmus is the most serious protein-energy malnutrition in the world, according to experts at HealthGrades. Children are most seriously afflicted in developing nations. The problem gets worse when these children are drinking contaminated water that complicates the condition. Not a pleasant thing to think about. Note: Seek immediate medical attention if you’re experiencing these symptoms. You may not have ever heard of cachexia which is also referred to as the wasting syndrome. Cachexia is the dramatic weight loss and atrophy found in patients suffering from chronic illness, including MS, diabetes, cancer, and people with HIV. 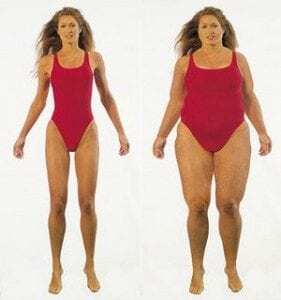 The weight loss is unintentional, usually associated with disease. According to AboutHealth, cachexia is present in at least 50% of people with advanced cancer, and causes 20% of cancer deaths. This disease causes weakened skeletal muscles and decrease in protein. PROTEIN C AND PROTEIN S DEFICIENCY- Protein C and S are natural substances in your blood that deter your blood from clotting. Think of them as natural blood thinners. Having a deficiency in one or both of these proteins leaves you high risk for abnormal blood clot development. This protein issue can be acquired if you lack vitamin K, or suffer from liver disease, kidney disease, or HIV. *Warm to feel If a blood clot or Deep Vein Thrombosis (DVT) has broken off you need to seek immediate medical attention! Protein deficiency is often preventable if you’re aware of the symptoms and take action. It’s important that you look towards prevention by ensuring you’re getting your 2-3 servings of complete lean protein each day. Women should aim for 45 grams of protein a day and men should aim for 55 grams. This varies with your body height and weight. Getting adequate amounts of health protein each day is all a part of healthy living. It’s a responsibility that needs to be taken seriously because it’s important. Choose wisely. *Poultry, Meat and Fish – Fish, pork, game, beef, chicken, and turkey work. It’s best to stick with leaner cuts of meat like beef tenderloin and ground round. *Dairy and Eggs – Eggs are an excellent source of complete protein. Milk, hard cheese and yogurt are also good choices. Just make sure you keep to lower fat and have in moderation. *Vegan Choices – There are a few complete whole food choices of protein from plant sources including quinoa, soy milk, tofu, and edamame. These are protein sources that aren’t complete and can stand alone. They don’t have to be eaten at the same sitting, just sometime during the same day, according to Natural Medicine. They are extremely beneficial and healthy for you. Balance is what you’re looking for. Understanding the type of protein that you should be eating is just as important as getting the right amounts that you’re eating. A smart move is to always choose a diverse range of protein sources, both complete and incomplete, to be included in your diet daily. This way you can tune into what your body is saying to see if you’re hitting the mark with protein! There has been buzzing in the media as of the last few years against protein claiming that there is an increased risk of osteoporosis and cancer and damage to the kidneys as a result of a high protein diet. These claims simply are not supported by any sound scientific research. Studies have also shown that folks with pre-existing kidney damage should restrict protein intake, but a high-protein diet has never been proved to cause any kidney damage. But ironically? A high-protein diet has been shown to improve blood glucose control and in addition to lower blood pressure in diabetics, which would decrease the risk of kidney disease, not increase it. People with diabetes will find that regulating their sugar levels easier by getting more protein in their diet. There are more than 29 million Americans who have diabetes and another 86 million are prediabetes, meaning an even higher rate down the road. But new studies done at the European Association for the Study of Diabetes meeting done each year now state that it may reverse that trend. Having a diet rich in protein may help type 2 diabetes patients improve their blood sugar levels. The information that I provide on my website is purely based on my own personal experience and subsequent research into the diabetes disease. It is not intended to take the place of medical advice,diagnosis and treatment. Care and investigation should always be sought from an appropriate health care provider. I am happy to discuss my own symptoms, diagnosis and history of my diabetes disease but want to stress that I am not medically trained in any way. All opinions on my website are my own. I have created this site as a way to share information and experiences. Does protein control blood sugar levels? Protein is important as by now I’m sure you understand. So I’m sure you know that the answer is yes.You want to try and balance your meals between carbs, fats, and proteins. Try to eat 25-30 grams of fiber each day. Proetin helps with blood sugars but maybe you still need to lower your numbers? I found this to really help get the numbers down! I hope that you enjoyed reading and that your eating habits change as a result. Any comments or questions would be appreciated. You may leave them below. Thank you for reading and go eat some protein! Is Broccoli Good for Diabetics?- Absolutely the Best Vegetable For You! Olive Oil and Diabetes-Groundbreaking News About Olive Oil! I have worked in fine dining for over a decade. I have had the honor to work Michelin star chefs and every service we had a 20-minute breakdown of the menus and I would pair wines with the different courses as I have my level one sommelier. Knowing what I know, I still learned things that I didn’t know from your site, awesome job!! I always have a rich, balanced full protein diets laced with different superfoods. I have a rare medical condition that will only progress over time. I now live in constant pain and because of it, I am now a clinical insomniac. So my diet has slid due to not working anymore but I would not say I eat unhealthily. I have tried everything to aid sleep from dietary changes, to sleep camps, pharmaceuticals, natural-homeopathic techniques, acupuncture, everything, the pain is what wakes me up within minutes of falling asleep, the sleep camp readouts even show that. Would upping the protein intake maybe help with the pain and sleeping more over? Hey and thanks for commenting. It sounds like you’ve been through a lot and appear to eat healthy. It seems like no matter what we do sometimes or how healthy we eat, there’s always a problem that we can’t seem to solve. Not sleeping is not good for you and we all know that. Relieving stress and eating properly with exercise are about the best things we can do. It sounds as though you’ve tried everything else. This is a very informative article. Well-research and provides broad facts about protein. I tried to workout for quite some time but was stopped due to my unoccupied schedule. I also take some protein supplement. Do you think it is good for me to continue taking protein supplement rather than from a food source? Your advice will be highly appreciated. Thanks. Well thank you for saying. I appreciate it. It’s all about helping people out who need to learn about protein and also lowering their blood sugar. Yes you can take a protein supplement instead of food, but it’s recommended to get protein from food sources. Try and eat the foods rich in protein and while we can’t always do this, the options are supplements. Thanks for sharing your website! The content provided is very clear and easy to navigate. I was actually doing some research on google and stumbled upon your website. I never knew protein was that important! Many of my friends only talks about protein when they are working out at the gym, but no one really knows the true benefits of it. I don’t have time to go to the gym, but I’m definitely going to incorporate this with my daily meal.Thank you so much for sharing this with me and I will most definitely recommend some friends to check it out as well! Hey Eric, I’m glad you enjoyed the article. Protein is indeed important for your heath. It has so many benefits and our body needs it to survive. It’s best to balance your meals with carbohydrates, fiber, and protein. The average woman should aim for 46 grams of protein a day and the average man should aim for 56 grams. More people should pay more attention to their protein intake. Thanks again and good luck with your protein!